When it comes to the world of financial planning & analysis, there is a push towards self-service financial reporting and analysis. What this essentially means is that you empower your finance staff to perform their own analysis, query the data, and generate reports by giving them access to the corresponding data and self-service financial reporting tools for finance. 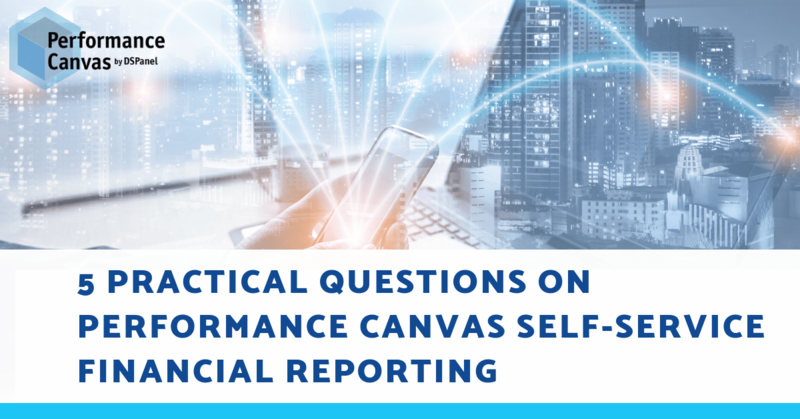 For those of you that are seriously looking for a solution that can address your self-service financial reporting needs, here are a few questions that might help you in your evaluation of Performance Canvas Financials. What are the baseline reports included in the Performance Canvas purchase? There is a bunch of easy to configure report templates for Income Statement, Balance Sheet, Cash Flow and others included in Performance Canvas Financials. In other modules like Sales and Advanced Financials, other reports are included as well. That said – to create a report from scratch and end up with the right figures in the report rarely would take more than 30 minutes for any report once system is set up. After that point “only” finishing of layout according to company graphic design is left, which is more often time consuming. Thus, normal report creation usually will be starting using an already very good layout and then you just change the content / figures within that layout. (again, most often less than 1 hour to create a completely new report that way). Would we need to build each model and add the dimensions or is there any that are out of the box already setup? The system is automatically set up with Financials model that is configured based on settings in the ERP system. Normally, adding of dimensions or creation of models is not necessary. If more advanced functionality is needed for reporting/ budgeting this may require further setup. Same applies to other modules like AR, AP and Sales if applicable. It sounds like even the Excel Plugin is passing Credentials based on the drill down capability. Is this correct? Yes. This is correct. Login credentials are used for Investigate/ drill-down. Is there a separate database? does it use cubes? SQL Server Analysis Services? It is in a separate database. It uses SQL Server Analysis and cubes which are automatically created and maintained. The main reason/ usage of cubes is to make the system very fast for complex reporting. Are there performance concerns? Do most people just create the database on the same SQL instance as their Enterprise Databases or does it need to be separate? This depends on volume of data. For Financials data, performance is very rarely an area of concern. Sales data usually goes to a much more detailed level and thus is more sensitive to the nature of business (e.g. certain businesses like Retail creates large volumes of order lines). Usually, the most critical factor is amount of memory allocated to SQL Server machine/ VM. If it is a VM – use of “bubble memory” or other memory not physically allocated to SQL Server instance can cause SQL Server performance issues. The main reason for splitting SQL server is to have zero effect from reporting on transactional loads. A common split is to install a separate reporting server that has its own SQL server instance as well as the Performance Canvas Financials application. Do you want to see a free online demo of Performance Canvas Financials´ self-service financial reporting capabilities? Email us at info@dspanel.com or visit www.performancecanvas.com for more information.